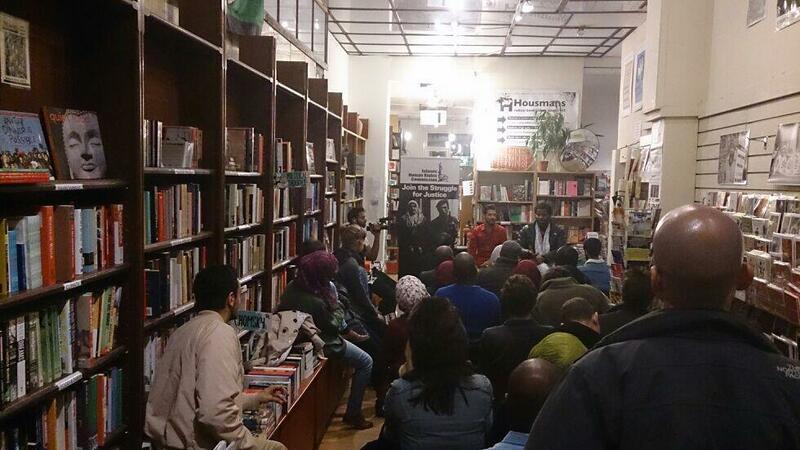 On Monday November 4th Nazim Ali of the Islamic Human Rights Commission hosted a standing room only event with spoken work poet Mark Gonzales entitled ‘poetic secrets to surviving the idiots’ in addressing the question “how does one stay alive in a time when it is almost painful to be intelligent?” in the pleasant surroundings of Housmans Bookshop in Kings Cross central London. This follows on from the previous events IHRC have had with Mark Gonzales including the conversation with Mark Gonzales and his participation at Genocide Memorial Day 2013. Mark Gonzales shared his philosophical reflections based around his concept of ‘waging beauty’, an affirmation of the human condition to positive resistance against all the manifestations of ignorance and negativity that surrounds us borne out of an unjust order. Joining Mark Gonzales were spoken artists Ibrahim Sincere and Wancee. Ibrahim Sincere recited his recent spoken word piece on Black History Month discussing issues of white supremacy, and Wancee from Tottenham in north London recited several pieces including his ‘storm no tea cup’ addressing the issues of Black working class existence in his area and the internalization of oppression of some in the community rather than developing struggles against police brutality. Mark Gonzales engaged with the question and answer session with his usual eloquence and insight into matters from Malcolm X to the relation between faith in Allah, the importance of storytelling between us and our forefathers and foremothers and the ways in which we can re-establish our human and connections with each other in order to heal from the fall-out from the oppressions we endure.